Welcome to my studio where I help people design lenticular projects using their own imagery and vision. The lenticular lens gets its name from a cloud, both are round on top and flat on the bottom. The lenticular lens is like corrugated cardboard, with multiple rows of curved ridges, called lenticules. Light enters the curved side of the lenticule and reflects off of the specialized print on the flat side, then it is refracted on exiting. Images are sent through a digital shredder and recombined in strips which align under each lenticule. Each lenticule covers the data from all the images in the set. The strips reveal in sequence as you change your angle of view. We thus create frames, like in a movie, that play across the arc of the lenticule. Up to 4 dissimilar or distinct images are possible in a phase set. With images that are similar (animations, morphs, and video) we can weave 20 individual frames into a project. This provides a butter smoothness in the transition. All life events can be highlighted with a lenticular design. Some common occasions are the birth of a baby, a first tooth, first haircut, school photos, a special birthday, graduation, wedding, anniversary, and remembrance portraits. The goal is to match the occasion with both the visual effect and product options. A ‘first tooth’ project would be fun as a ‘2-Flip’ before-and-after, and done as a pendant. A wedding kiss from video would make a lovely gift as an 8 x 10. The number of photos necessary for a successful design varies according to the effect you choose. 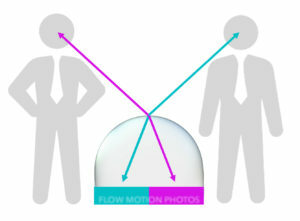 A single image can be animated (hair blowing, water flowing) using a ray-trace technique, two images can be morphed, up to four images can be flipped (basically a quick dissolve), and up to 20 frames can be used from animation or video. Once set, your design can be adapted to set beautifully in most project options. Feel free to contact me with any questions: Eric@FlowMotionPhotos.com, Etsy’s conversation function (see ‘Shop’ in the above menu), or simply use the Contact form here in the studio. Here are some examples to spark your creative interests. Flow Motion Photos bring smiles to the world!